It’s time for another giveaway! 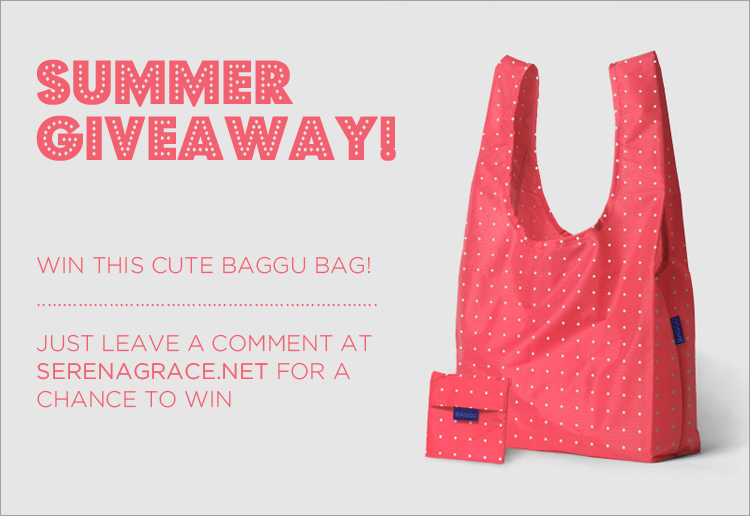 This time I’m giving away a super cute Baggu bag (in papaya dot). I really love Baggu’s re-usable bags! They make them in such fun colors and cute designs, and I’m always excited to take mine to use at the grocery store. The bag feels really durable and it holds a surprising amount of stuff! And when you’re not using it, it folds up into a cute little pouch. For a chance to win, just leave a comment anywhere on the blog. A winner will be selected next Wednesday, August 17. Good luck! Ohhhhh I feel like I might need one of these in my life! oohh! ive been wanting one for so long! pick me! pick me! love the polka dot design...so cute! Very cute! I'd love it!! I love this bag almost as much as I love your blog! ;) thank you for the chance! i have the same exact one, but i want another! YAY! I love baggu. I love reading your blog, too! perfect for all grab-n-go occasions! i'd love it! Love the bag! Please enter me into the giveaway!! Thanks!! Baggu bags are awesome! My friend had borrowed my resuable bag, but she wont be back for another month (she's in Thailand at the moment). I'd love another one! Cute bag -- thanks for the opportunity to win it! Love your pics and blog. Darling! I would love to win. I have been wanting a baggu bag for awhile now. I love eco friendly things! lovely photo blog. never heard of these bags before but i'd love to win! so cute! I like the fact that it's re-usable and very nice. This could be a nice present for my best friends birthday. Pick me!! :)) <3. I love this color and reusable items are always the bessttt items :). I love Serena Grace and I love bags.